Add the onion, garlic cloves and fresh rosemary to the slow cooker. Then pour in the tomatoes, vinegar, wine and stock. Season well and stir thoroughly to combine all ingredients together. 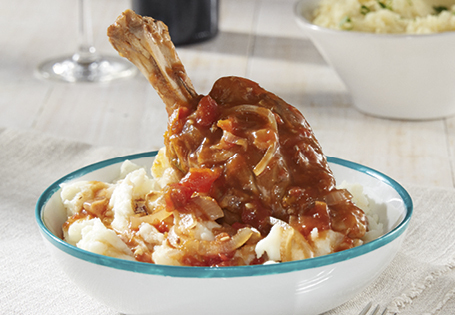 In a large frying pan over a high heat, brown the lamb shanks on all sides. Then add them into the slow cooker, coating them in the sauce so that they are almost totally covered. Cover with a lid and cook on the low setting for about 5 hours, checking occasionally as cooking times may vary. Skim to remove any fat that has risen to the surface.